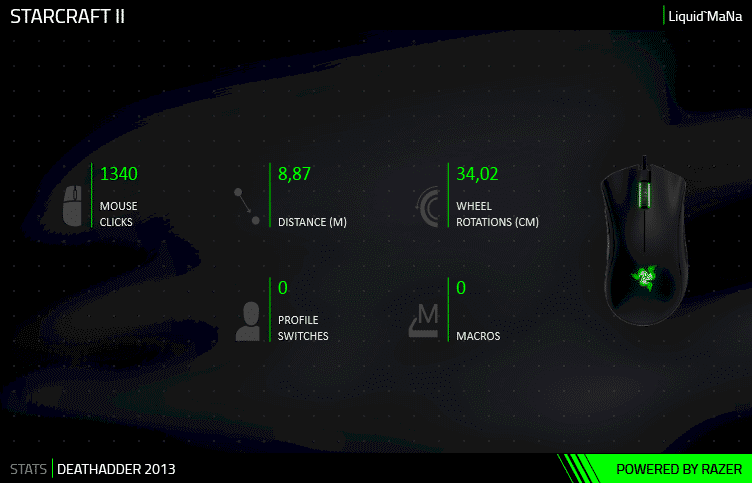 Synapse is Razer’s hardware configuration software. Most gaming companies release software to go along with their gaming hardware so that you can configure everything from the DPI of your mouse to the lighting patterns on your keyboard. 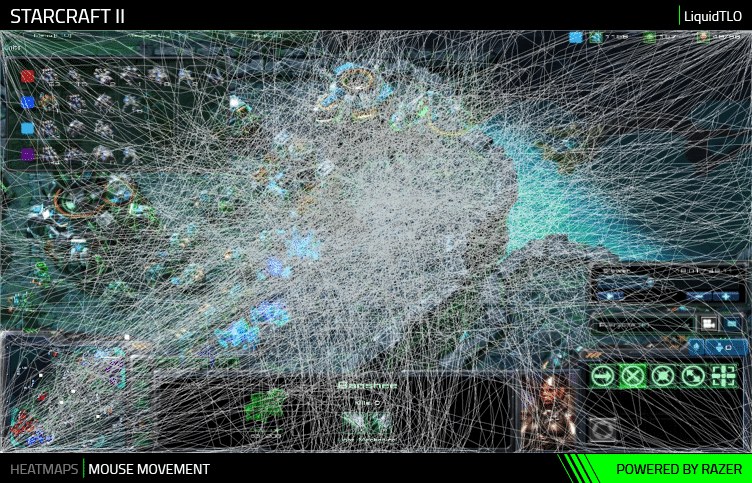 Synapse is simply Razer’s name for their own software. If you buy a Razer product and you want to do an in-depth configuration of the product you’re going to need download Synapse. You then need to make an account with Razer and after that you’re all good to go. The software was first introduced in 2011, and is now on to its second major iteration (Synapse 2.0) with the 3.0 beta being publicly available as well. 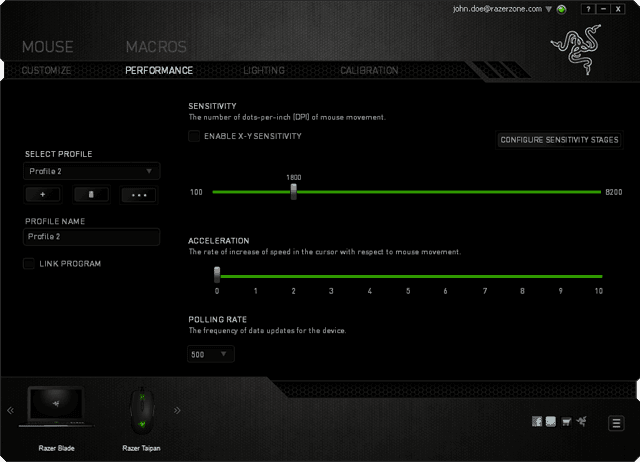 Aside from the regular hardware stuff such as lighting, DPI, creating macros and what not Razer also offers a bunch of extra functions such as lighting patterns that respond to whatever is happening in (compatible) games. You can even link up your Philips Hue lighting system with the software so that your entire room (or house, if you want) responds to ingame events, giving you that extra touch of immersion. As mentioned; you can set macros and configure all of your devices to your heart’s content in Synapse’s software. These settings are then saved to the cloud, so that you just have to log in to the Synapse software on any device that has it installed in order to load all of your personal settings, meaning that you don’t need to be tinkering with your gear every time you go to play games away from your PC. It has all of the regular features such as the ability to adjust DPI, report rate, RGB, mic- and headphones volume, keyboard shortcuts, and so on and it also has slightly more advanced control options, such as the ability to do surface tuning for your mouse. This means that the sensor of the mouse will adapt to whatever surface you’re playing on, ensuring that you get the best response possible response. 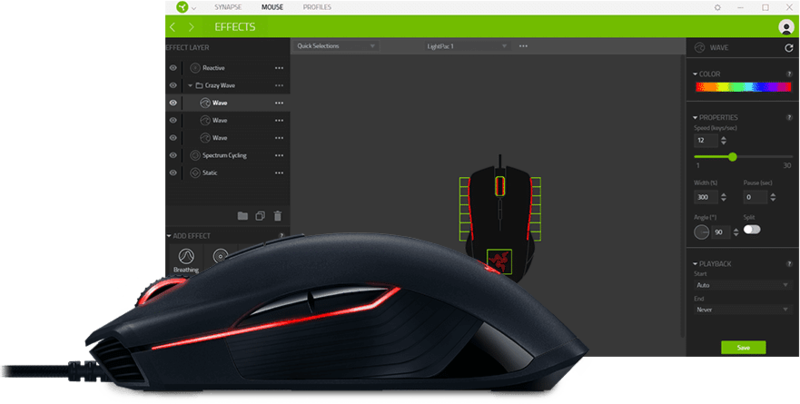 When it comes to overall functionality Razer’s Synapse really doesn’t have an equal: you can control nearly every aspect of your gear, be it on the functionality side (assign different reactions to certain keys or buttons, …) or the aesthetics side (custom lighting profiles, …) so the software does come with a bit of a learning curve if you really want to delve deep and go ham on all the possible options. Normal tuning (standard RGB profiles, standard macros, and so on) is easy enough and self explanatory from the get-go though. There’s an online workshop as well, so you can download various user profiles from other users, as well as a host of different apps so that you can, for example, see when a new Discord PM has arrived on your keyboard or even get your keyboard to be a bomb timer in CS:GO for you. Synapse can also record your statistics, such as keystrokes, mouse distance traveled, number of clicks, and so on and you can share your stats through social media and compare your stats to those of the pros. All of this functionality in itself might not be the most useful or performance enhancing, but with all of this does help people really personalize their gear setup in order to get the best out of their gear and their games. You might not want to use any of the more advanced functions, but if you want to it’s there, and who ever says no to free extra options? You can check out Razer Synapse online here. 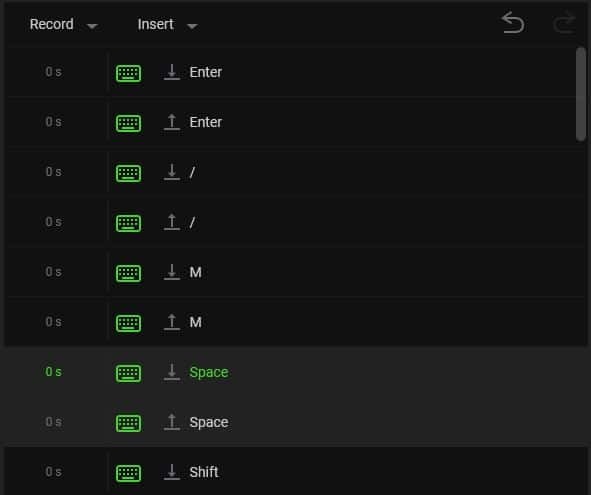 Razer Synapse is an essential tool for creating and storing custom settings profiles for all your Razer devices, but we really love the ability to easily set up macros. If you’re playing games where you need to push several buttons in order to get a desired effect it’s going to be a lot easier to condense those actions down to the press of just one button. When you’re making a macro you’re essentially just recording inputs, after which you assign all these inputs to a certain button (or button combination) which then replays all the actions you recorded. This can be extremely handy for all sorts of games and situations; you can set macros to automatically perform a series of buff/debuff spells in games, or you can bind a specific button on your keyboard to buy your loadout in CS:GO. The possibilities with macros really are endless, but do be wary that not all macros are legal for competition. Using a macro for bunny hopping in CS:GO can get you banned by CS:GO’s overwatch system, for example, so always check what you can and can’t do beforehand. To show how easy it is to record a macro with Razer’s Synapse software we’ll show you how to create a macro that automatically types ‘good luck, have fun’ in Overwatch’s game chat. 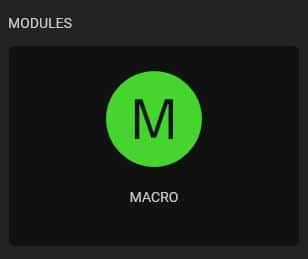 Install and open Razer Synapse’s Macro module. Click the + button on top of the macro list to create a new entry. 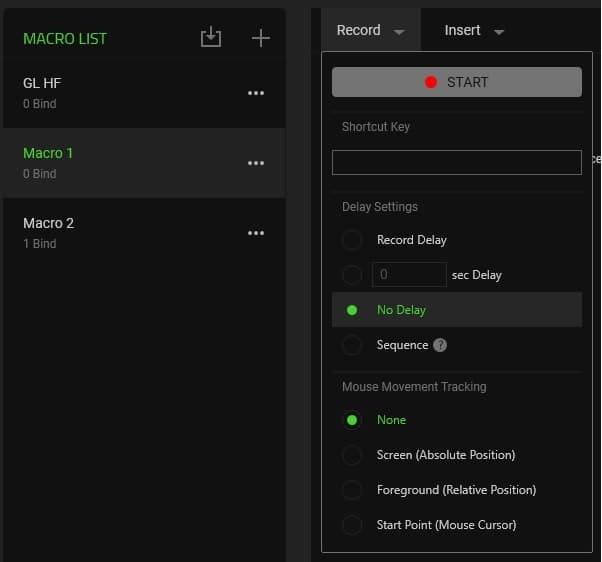 If you go into the record drop down menu you’ll see a list of options for your macro, including whether or not you want your mouse movements to be included in the macro. In this case we don’t want that. We do want our text to show up as fast as possible so we’re gonna select ‘no delay’ under delay settings. Press the record button and then do the following, where BOLD indicates a keypress and cursive indicates that you should type: ENTER /m SPACE Good luck, have fun! ENTER and then hit the stop button. Your macro has now been recorded and is ready for use. You can rename your macro (which is recommended in order to keep things organised) by double clicking the name of the macro. Now you still need to bind your macro. In this case we’ll be binding our freshly made macro to one of the two extra buttons on top of our Razer Deathadder Elite. Click on your macro and click ‘key binds’ towards the right hand side, then choose whichever device you want to bind the macro to. In this case we’re binding it to our DA Elite. Select which button you want to use (in this case we’ll use the ‘sensitivity stage up’ button) and select how many times you want your macro to be played per press. In this case that’ll be once, since we don’t want to spam the chat. Just click save, and once that’s done your macro will be bound to the button in question. This is obviously just a silly example on how macros can improve your QOL when gaming, but it goes to show how simple it really is to record macros with the software, so do go out and try for yourself, the possibilities are endless and they don’t have to be limited to gaming either. You can create a macro that automatically opens up all of your favorite websites at the push of a button, for example. Whatever it may be; you now know how to create a macro, so have fun with it, but do be careful that you’re not breaking any ingame rules while doing so.